Uruguayan forward looks set for summer exit from Serie A side. The mother of Napoli striker Edinson Cavani has revealed that her son is keen to leave the club this summer, according to The Daily Mail. 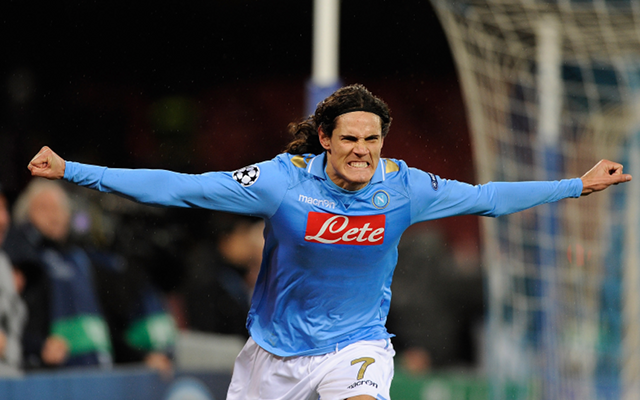 ‘He told me he wants to elsewhere and to leave Napoli,’ said Bertha Gomez, Cavani’s mother. ‘Edi doesn’t know what will happen yet. Her words are sure to be music to the ears of a number of top European managers with Cavani currently being one of the most sought after strikers on the planet. Cavani has won a whole host of admirers after a number of impressive seasons with the Italian giants. He is currently top of the goalscorers chart in Serie A and his goals have fired Napoli to second place in the Italian top flight. Those performances have not gone unnoticed and a number of clubs, including the likes of PSG, Manchester City, Real Madrid and Chelsea, are thought to be ready to make a summer bid for the player. Napoli know they may be defenceless to hold on to the player after the club’s president admitted Cavani has a buyout clause in his contract thought to be in the region of £60 million. The only way the club could hold on to the player is if Cavani turned down the move but his mother appears to have confirmed the striker is looking to depart the club in the coming months.